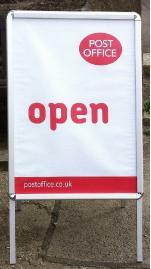 Post Office Ltd. has been operating an outreach service in the village since March 2014. It opens for two mornings each week: Tuesday and Friday from 10 a.m. to 1.30 p.m. and it has been based in the ground floor of the Town Hall which is also used as the Grampound Heritage Centre. As from Friday 25 September, it will be based in the coffee shop next to the village store in the car park at the bottom of the village. It is anticipated that customers will find this new location much more convenient with a visit to the post office combining with calling into the village store. There is also parking at this site.